One of the benefits of your own putting green is you and your contractor can design any size or shape you like. 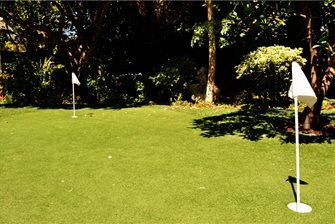 A backyard putting green is a great place to spend casual time outdoors with family and friends..
Backyard putting greens are fantastic way of bringing together friends and family to enjoy the outdoors. “It’s kind of like having a pool table. When you have people over, there’s always something to do,” says Steve Biernacki of WaterQuest, Inc. in Albuquerque, NM. Learn more about designing a backyard putting green with these pro tips. Dos and don’tsDo place it close to the house. “It’s best to incorporate landscape features into areas you actually use,” says Biernacki. “If you push things too far out into the yard, you may not use them.” A backyard putting green has such a great social element to it that you’ll use it a lot more if it’s close to patios or other entertaining areas. Remember not to place it too close to windows, parked cars or play areas. Though you may only plan to put on your green, chip shots do happen and family members, particularly kids, may swing a lot harder than your green was ever meant to endure. A flat one-hole putting green gets boring fast. However, if you make it challenging, friends and family will enjoy the putting green for years to come. Biernacki suggests using a few undulations, mounds, a sand pit, and about three holes to keep it interesting. Most backyard putting greens are created with artificial turf, because mounds, sand pits, and interesting shapes can be hard to irrigate and mow effectively if you use living turfgrass. Artificial turf also has an even surface that’s ideal for putting. Synthetic greens are virtually maintenance free. They're able to withstand hot or cold temperatures, as well as wet conditions, and are just about always ready for play. Don’t worry if you have pets. Artificial turf drains well and pet messes can be cleaned up easily, almost more easily than on regular turf. That said, artificial turf can heat up in the sunshine and burn pets’ paws, so make sure your pets have a shady location close by to relax while you’re using the putting green. Don’t forget the landscape lighting. With the pressures of school, work, and other activities, oftentimes family members don’t get home until after dark. Incorporate low-voltage landscape lighting into your backyard putting green to extend the number of hours each day that you can use it. Cost of backyard putting greensA backyard putting green constructed of artificial turf costs an average of $14 per square foot. Contrast that with an average of $8-$12 per square foot for a regular artificial turf lawn, and a backyard putting green looks like a very good deal indeed given the use you’ll get out of it. When designed with creativity and a spirit of fun, a backyard putting green can be a popular gathering spot for friends and family to enjoy one another’s company and the pleasures of the outdoors for years to come.